“Punic Island” is the third volume in the Campaign Commander series and simulates the campaign for Sicily and North Africa during the First Punic War. The system takes away from Second World War and goes to Ancients. In 264 Roma was summoned to Messina by Mamertines mercenaries to help in their quarrel with Cartage, the main power in Sicily. Carthaginians count on Hiero the Tirant of Syracuse to help defeating the Mamertines. Here begins the First Punic War. Romans and Carthaginians fought for 22 year over Sicily and in North Africa. Rome emerged victorious and Cartage was obliged to quit his long standing presence in Sicily. The land campaign was a long string of Roman victories as city after city was subdued and every Carthaginian army was defeated in battle. Syracuse was forced to make an alliance with Rome and Cartage was left with only a few fortresses in the island. Anyway the war was won and lost in the sea. The war saw the emergence of Rome as a sea-power and a long string of naval victories allow Roman troops to menace even Cartage proper. Only to be saved by Xantipus and his mercenary army at the Bagradas Plains battle. Naval warfare played a prominent role in this war and will give Carthage Senate his las blow. Carthage tried to spend the Roman effort during the whole war. His strategy was of attrition and was unsuccessful; Rome never gave up a prize. The game is developed in an operational scale – area-based map. It is designed for two players with one running the ROMAN forces and the other the CARTHAGINIAN forces -including Syracuse. The game lasts approximately 3-4 hours and uses a two sided system to handle the mechanics of play: cards and counters. The players will have to use their troops and their resources to obtain victory points while eliminating enemy forces and occupying cities in the map. It is not a card driven game as the cards are used to bring about events that influence battles, secure reinforcements, and provide resources with which to carry on the fight. The ROMAN player will be on the offensive during the whole game as he has to conquer the whole island to get victory. CARTHAGINIAN player focuses on spoiling Roman campaigns and plans with ambushes, sallies and bad weather cards. Also he has to recruit an army as he doesn´t has any at the beginning of the game. The ROMAN player must plan his offensives carefully as he will need a new army and resources for each one. Also he will need to build a fleet his doesn´t have at the start of the war. The sea contest will be evenly match and you better take into account bad weather as it sinks more ships than enemy action. Siege warfare takes a prominent role in this game as every city in the game map is a walled on with his own intrinsic garrison. 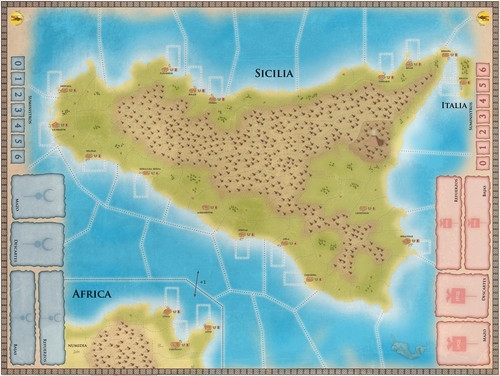 - 1 80x60 cm map of Sicily and North Africa. 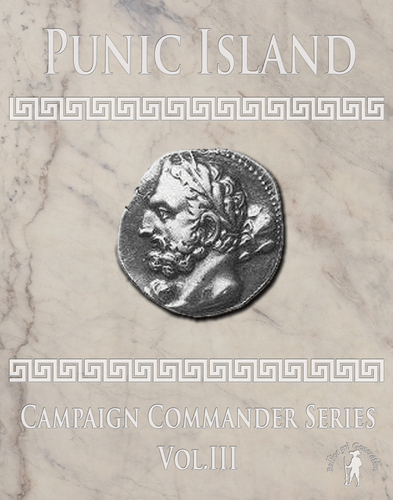 - 1 Rules Book for the Series “Campaign Commander” and Exclusive Rules of “Punic Island”; historical and designer notes.